Tutoring hops on a trellis is effortless when using HORTOMALLAS support netting. Hops supported by HORTOMALLAS trellis netting provide better aireation and reduce labor costs. 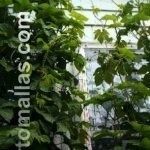 Hops can grow many meters vertically and HORTOMALLAS trellis netting is easily used for this purpose.